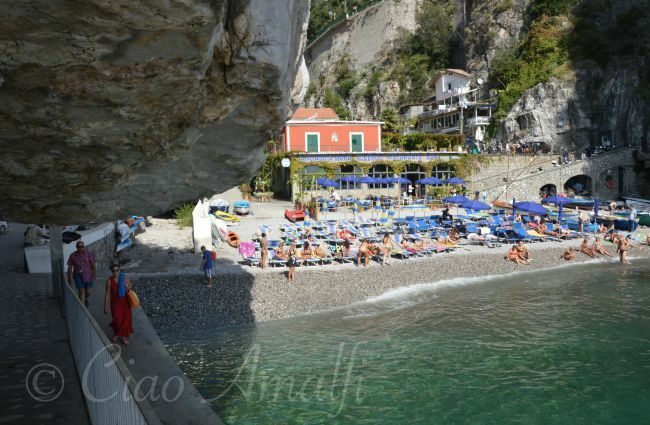 Marina di Praia – My New Favorite Beach on the Amalfi Coast! I think I have a new favorite beach. But shhh … don’t tell Santa Croce. 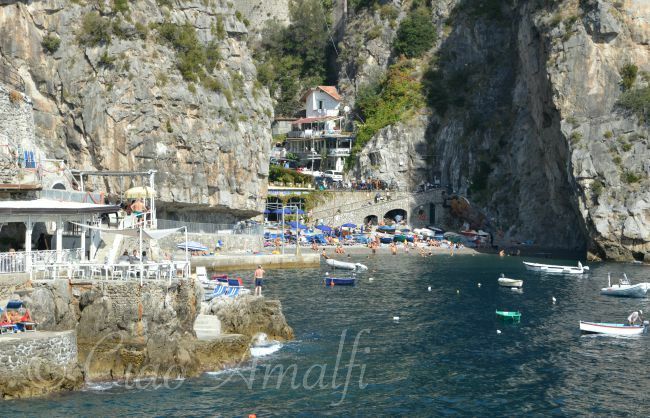 I’ve always like the little cove at Marina di Praia, located between Conca dei Marini and Praiano. The road clings to the mountainside high above the beach and a small access road that’s pretty easy to miss leads down to a tiny seaside village. The beach really isn’t much wider than the photo above, as you can see the shadow of the rocky cliff on the left. But what it lacks in size it sure makes up for with scenery and things to see and do. Locals call the beach La Praia or simply Praia, and the pebbly beach is the biggest draw during the day in the summer. 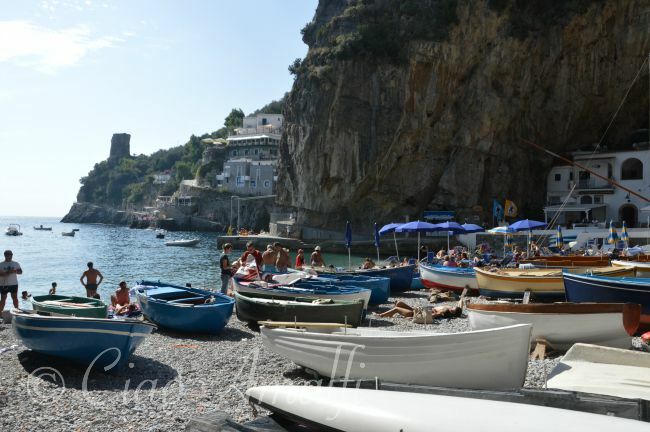 But instead of being covered with rows of perfectly lined up umbrellas, the beach is mostly covered with boats of all shapes, sizes and colors. I love that! There are umbrellas and sunbeds for rental though, and if you’re planning to spend a day that’s the way to go as the beach isn’t very comfortable for sun bathing. But back to the boats! 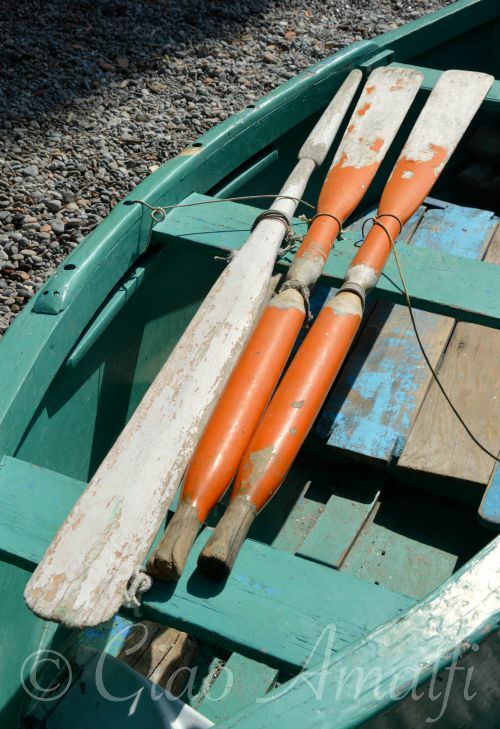 I had my camera with me when I went to the beach at Praia, and just had to spend some time wandering through the boats and capturing their colors and patterns. The weathered wood and chipped paint reminded me of the first time I visited Marina di Praia back in the early spring of 2008 when the boats were being repainted and the stones on the beach were speckled with drops of green, blue, red and yellow paint. 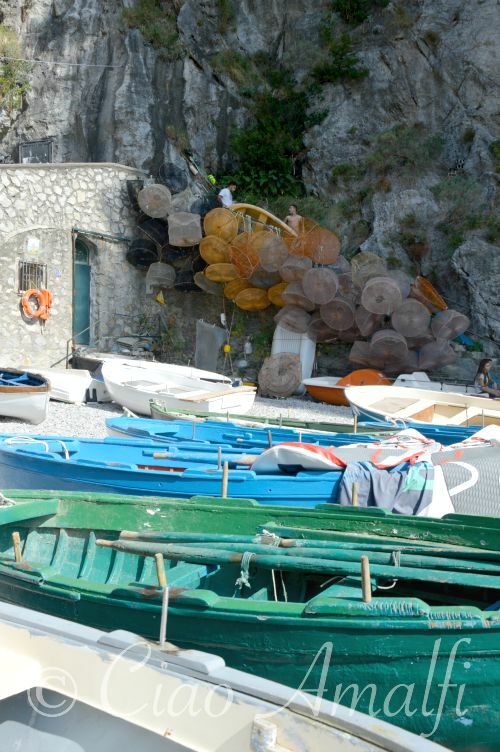 The boats lined up on the beach and the fishing nets covering the wall nearby are such beautiful reminders of the simple life that was once all there was on the Amalfi Coast. It’s still there in all the villages along the coast, but it’s just a little easier to spot in some places. 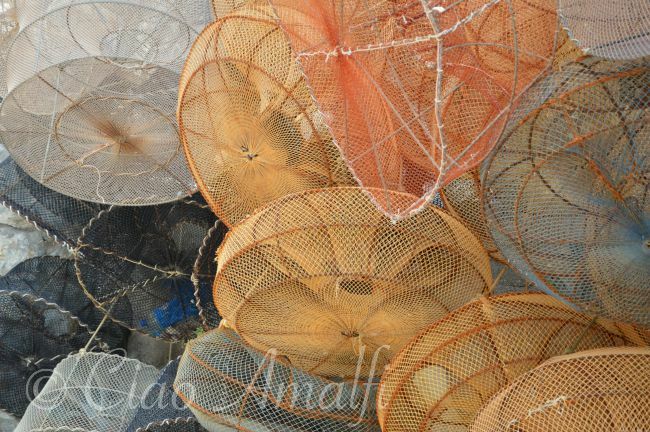 The nets were just fascinating with their colors and different shapes and sizes. The local fishermen likely though it was a bit nutty how much time I spent photographing this impressive wall of nets. Although I’m sure it’s a fairly common occurrence! 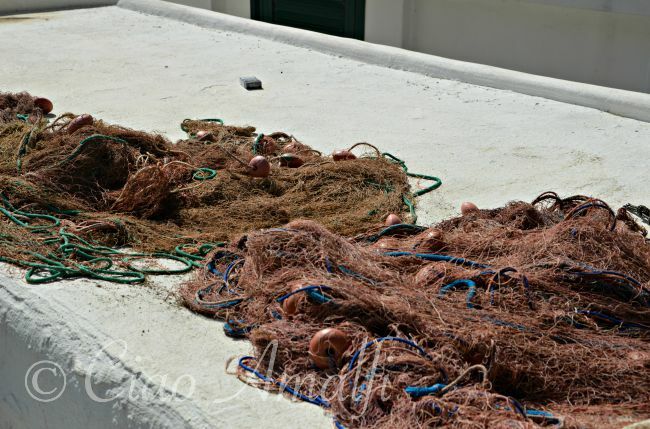 Nearby the beach a wide wall was covered with fishing nets. I wondered if they were there because they needed patching and where the fishermen had wandered to. Maybe to the nearby cafe for an espresso before tackling the laborious project. 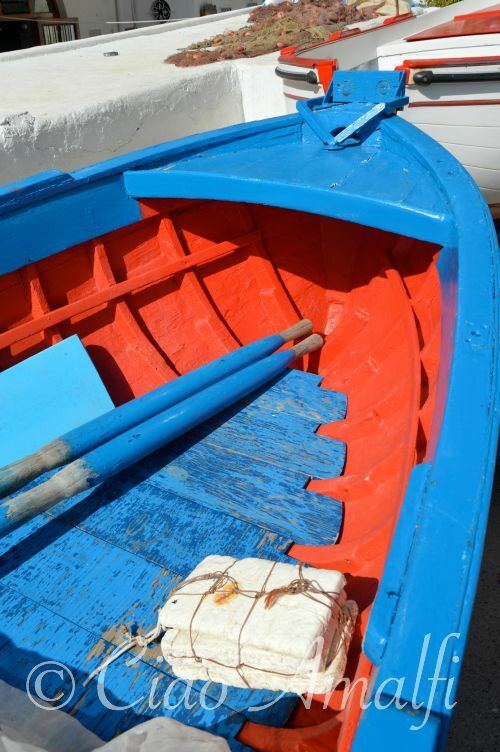 Just when I thought I had seen all the boats, I found this bright red and blue beauty. What do you think, does red and blue work for a Christmas card this year? 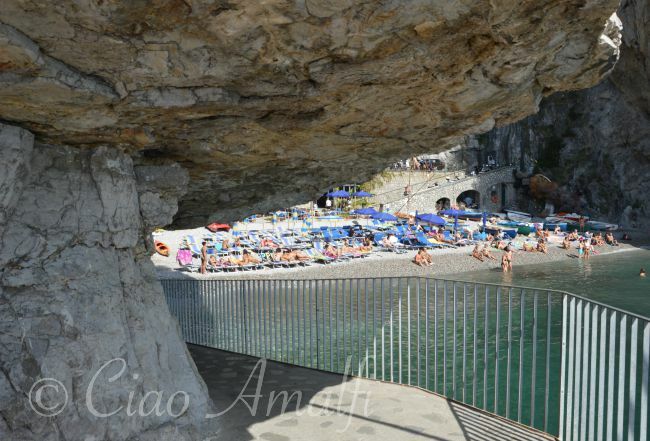 There’s another lovely feature at Marina di Praia that makes it one of my favorite beaches. Starting nearby the beach there’s a walkway carved into the rocky cliffs that leads past some houses and to the famous Africana nightclub in Praiano. The beginning of the pathway leads right under the cliff. Best not to think about it too much and enjoy the view! Following the walkway leads away from the beach and west along the rugged coastline. The sunny beach comes in and out of view with the winding of the pathway. – Say goodbye to the beach! 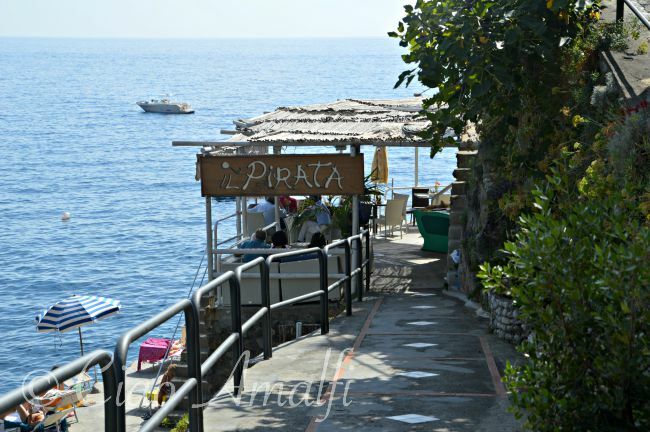 The pathway leads right through the Il Pirata restaurant, which has one of the most incredible dining areas overlooking the sea that I’ve ever seen. It’s especially magical at night! As you walk by, take a peek inside since it’s quite unusual having been carved out of the mountainside. – This restaurant is located inside a cave! Just past Il Pirata you have a great view looking back toward the Marina di Praia beach where you can see how it’s just a small cove in the mountains. 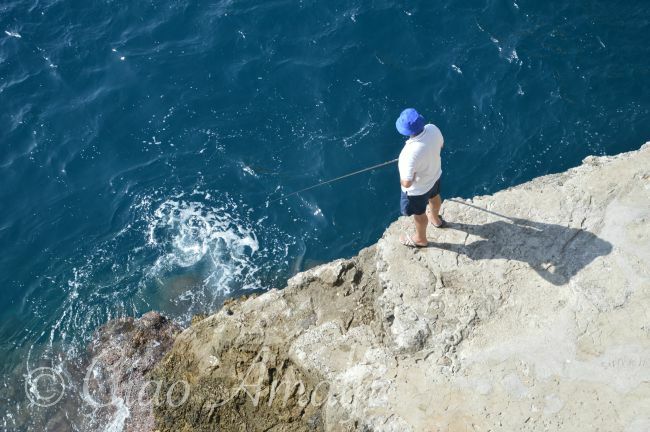 Every single available spot – even the most precarious looking – seems to be taken for swimming or fishing or sunbathing. 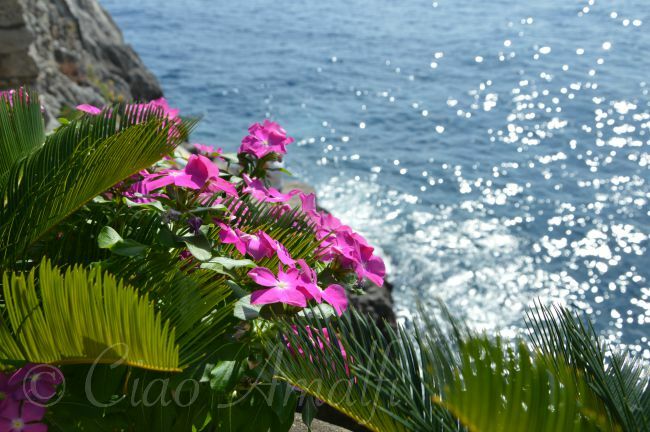 When you’re not looking down at the sea and waves crashing into the rocks, take a look east to see the distinctive Capo di Conca jutting out into the water near Conca de Marini. If I could stay in just one place, it would be this spot along the walkway in the photo below. That’s one of my happy places my mind travels back to again and again. Just around another corner sits the Africana nightclub carved into the mountain. During the day all is quiet and the light sparkling on the is far more appealing. 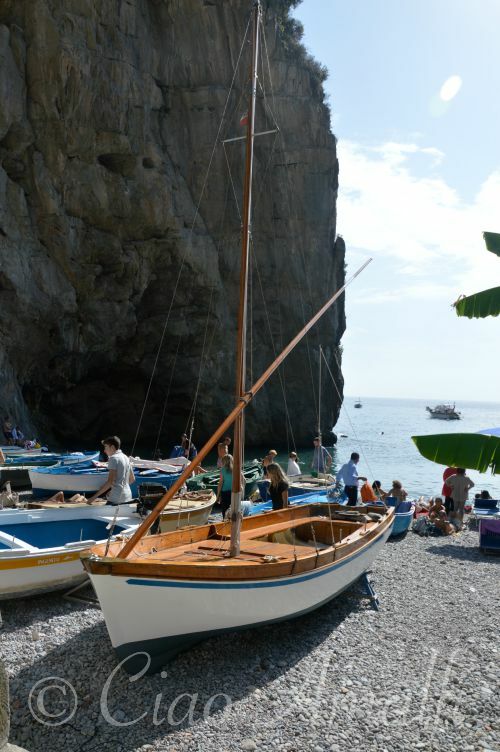 Back on the beach, wander not far inland from the beach and you’ll find a pretty little piazza with more boats and a whitewashed church that seems like it would be more at home in Greece than Italy. – Can I just stay in this spot and never leave? I couldn’t get enough of this perfect little church with its white facade, teeny bell and strings of fairy lights above the entrance. I peered and peeked but could only get the tiniest of glimpses inside. – Don’t you just want to hear that bell ring? I love a beach with things to see and do as well as beautiful water and good swimming. That’s exactly why I’m smitten with Marina di Praia. It’s a storybook setting and I want to write the stories that flutter about in the back of my mind as I wander along the sea and imagine weddings and village celebrations in that tiny church. Of course, you don’t have to go far to find some excellent restaurants in Marina di Praia. 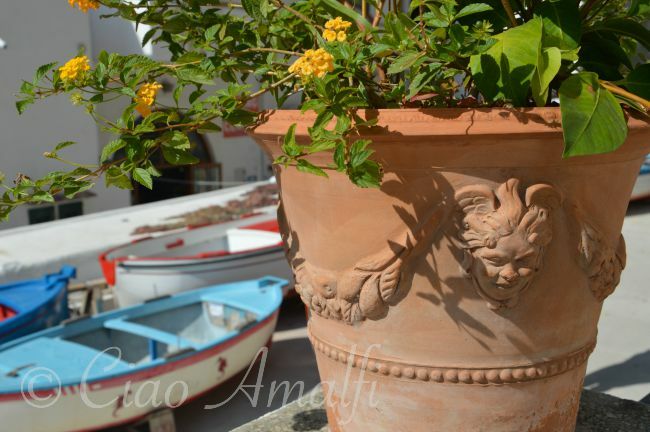 My favorite is Da Armandino, which is just a few steps from the beach. 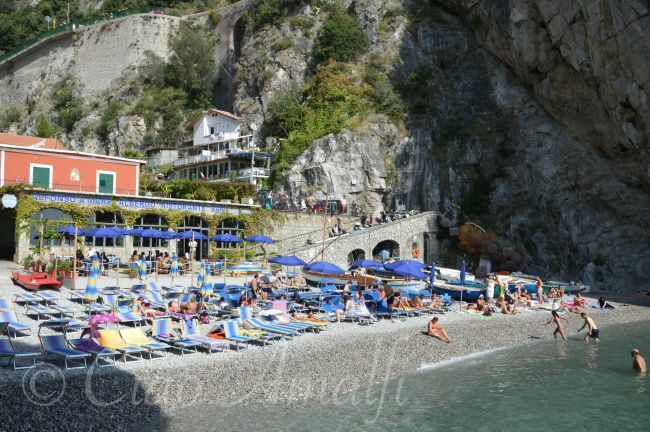 So whether you’re looking for a special day at the beach, a great lunch spot or a romantic dinner on the Amalfi Coast, you’ll definitely remember your time at Marina di Praia. 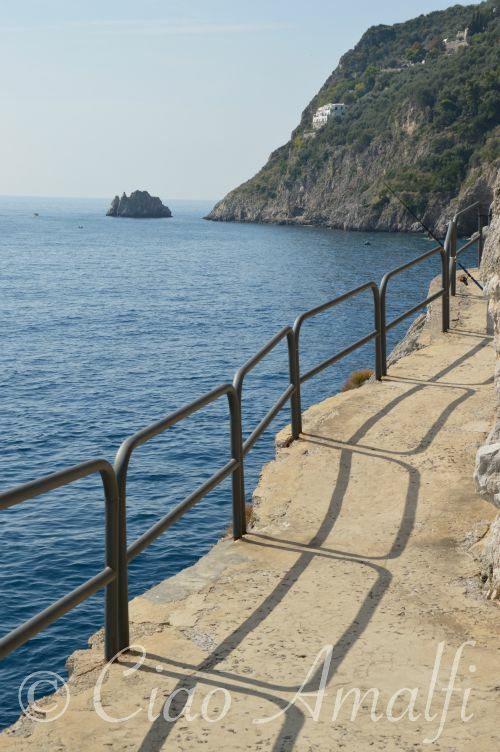 Make sure you take that walk along the sea … and tell me what stories you imagine taking place in this beautiful little cove on the Amalfi Coast! 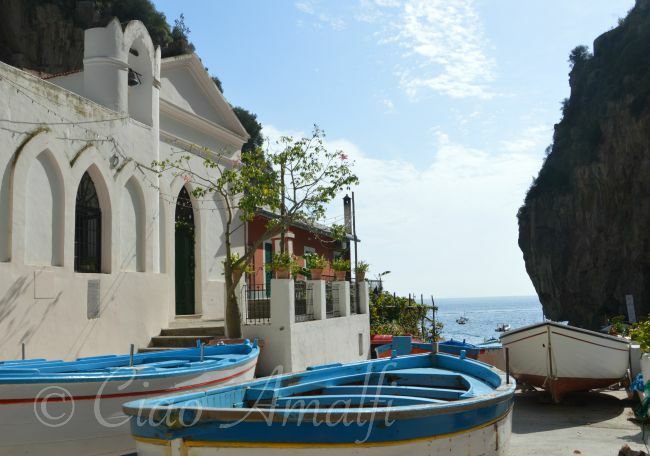 New Live Streaming Webcams of Amalfi! 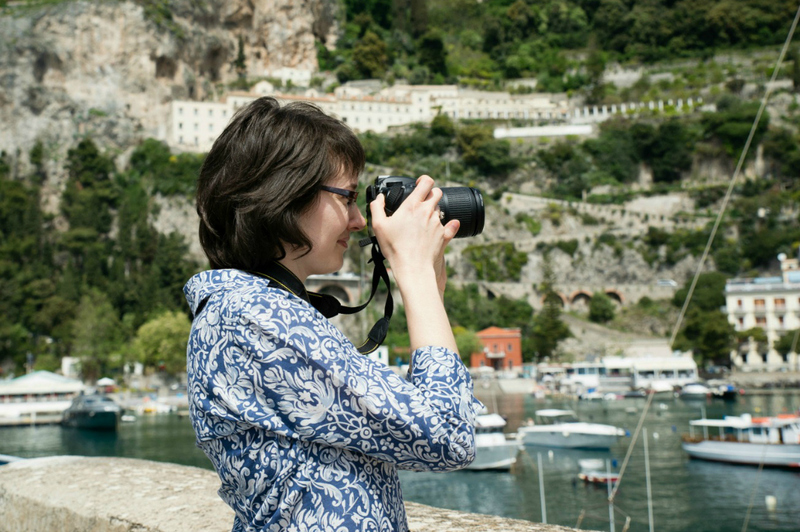 If you’re like me and miss the Amalfi Coast all the time when you’re not here, then I’ve got exciting news. 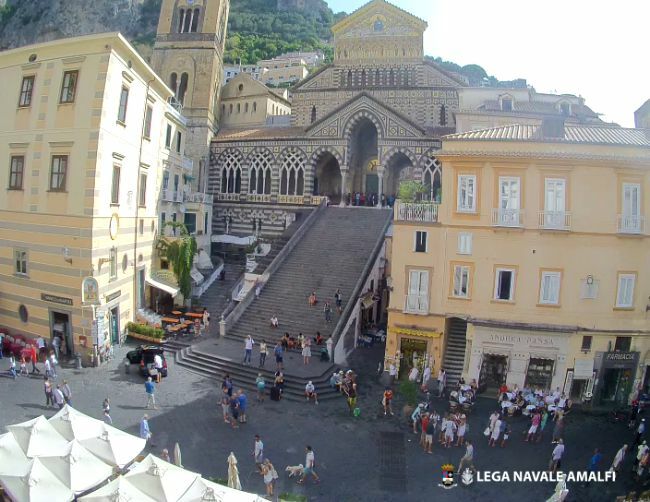 The Lega Navale Amalfi webcams are back! They’re not only back, they’re better than before. 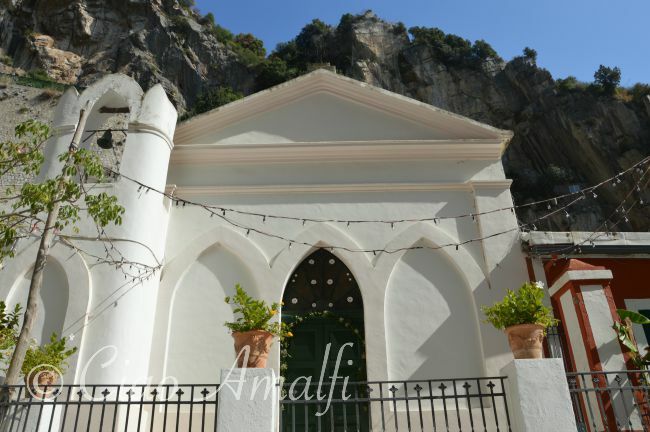 There are three new HD live streaming webcams located around Amalfi and the images are much clearer than they used to be years ago. 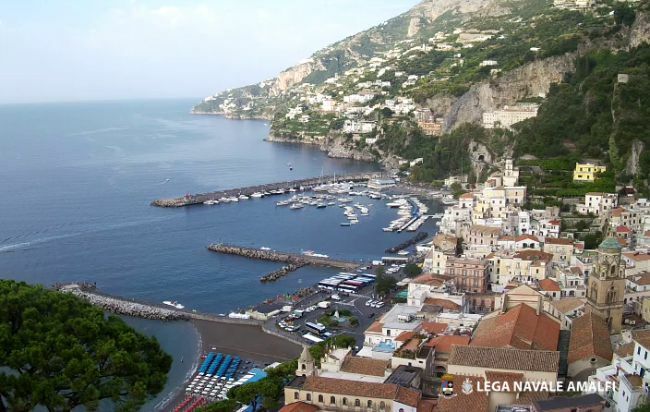 There’s even a new webcam, pictured above, that looks down over Amalfi and shows the entire port. Click on any of the images in this post to go to the webcams page where you can watch live. 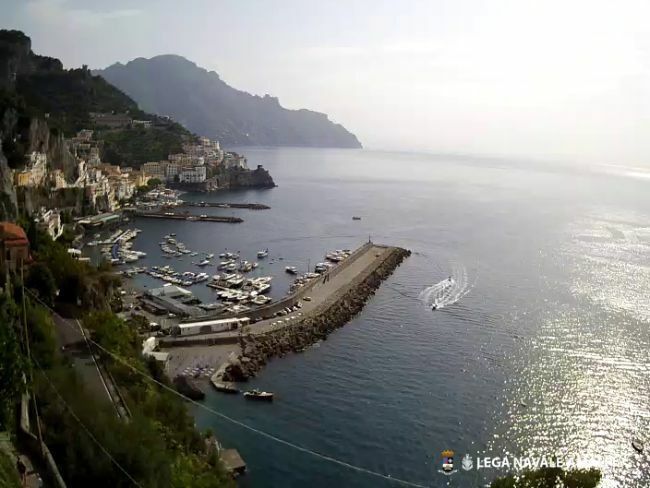 Or click here to see the Lega Navale Amalfi webcams. After my first visit to Amalfi in 2007, I spent over a year going back and forth as I finished my Masters in Art History in Minnesota. 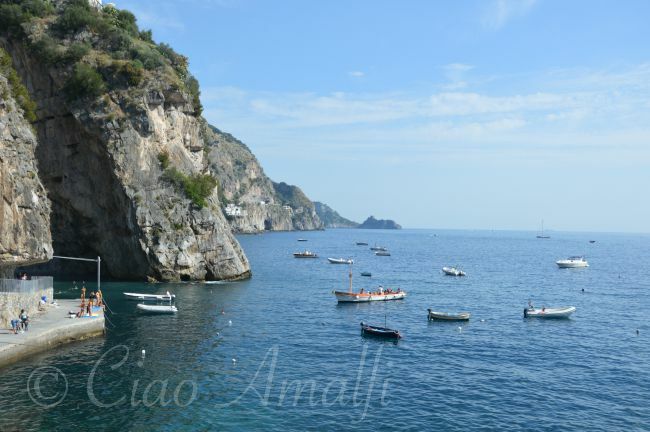 I spent a lot of time missing Amalfi and watching the webcams. It felt like a small connection! With late hours studying at night, I often watched the sun rise over the Amalfi Coast with the webcam (below) pointed toward Salerno. It’s also fun watching the hustle and bustle of Piazza Duomo from morning until late at night. With the live streaming you can even watch the sunlight sparkle across the sea. That’s the stuff travel dreams are made of! 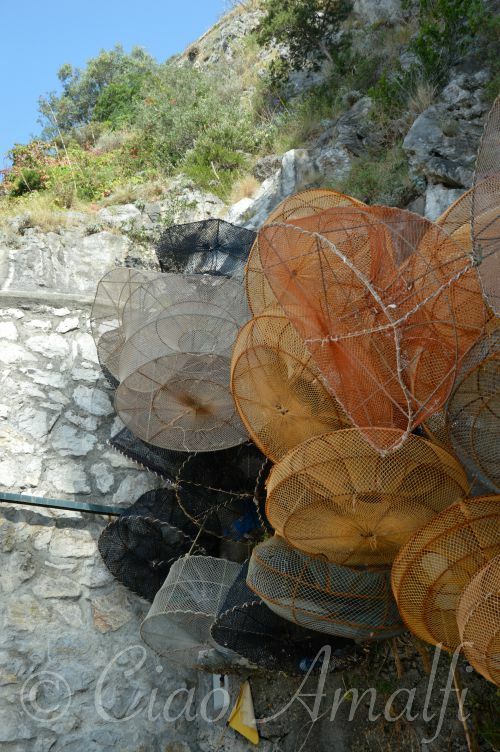 I hope you enjoy catching a glimpse of daily life in Amalfi with these new webcams. A huge thank you to Lega Navale for hosting them!